If you are considering a borehole for water supply, Hydrogeo can assist with every stage of the process. Private water supplies for properties without mains water. Private water supplies for properties to replace intermittent or poor quality springs. Abstractions for irrigation, landscaping and leisure uses such as golf course and polo clubs. Large scale supplies for commercial and industrial purposes, such as manufacturing, cooling and quarrying. How do I go about installing a borehole? The first step towards installing a water borehole is to commission a borehole prognosis report. Hydrogeo review the site geology and hydrogeology and provide an assessment of likely available groundwater quality and quantity. If the water quality and well yield appears favourable, the report will provide recommendations on borehole target depths and construction. Hydrogeo can produce these reports for any area of the UK, and routinely progress borehole prognosis reports for domestic, commercial and industrial clients. If you require less than 20,000 litres of water a day, then no license is required for a borehole. If you require greater than 20,000 litres a day, Hydrogeo can manage the license application on your behalf. 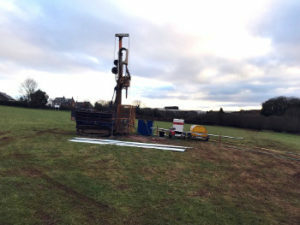 Following the completion of a borehole prognosis report, Hydrogeo can recommend local drilling contractors, or if you wish obtain quotations on your behalf. Providing the borehole prognosis report allows drilling contractors to produce a fast, accurate quotation, and reduces uncertainty in costing and drilling. During the drilling of the borehole, Hydrogeo can offer site supervision for the drilling and installation process. 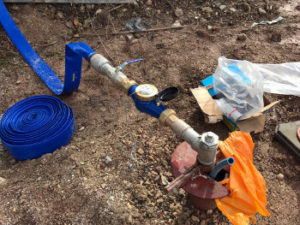 Following the installation of the borehole, if you require a license Hydrogeo can take care of the license application and liaise directly with the Environment Agency, SEPA or NRW. Hydrogeo can carry out the pumping tests and reporting that the regulators require for a successful license application. As every site is different, please contact us to discuss your project and requirements. We are happy to discuss your needs and offer an initial appraisal of your site free of charge. There are very few places in the UK where it is not possible to drill a water well – where we think the prospects are very low we can let you know before you commission a borehole prognosis report. Even in England’s green and pleasant land, maintaining golf courses in a lush playable condition requires irrigation during the dry summer months. 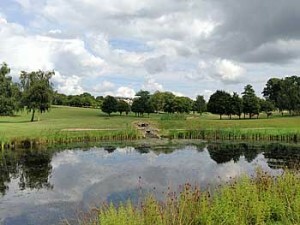 A golf course in Kent suffered rising mains water costs, and high peak water usage led to poor water pressure. The installation of a borehole allowed significant cost savings on mains water, and increased security of supply. This rural property on the outskirts of Abergavenny sourced its water from a spring, which had a tendency to dry up in the summer months. Following the installation of a borehole, the property now has year round access to a reliable water source. As an added benefit, the water quality of the groundwater supply also greatly improved. This quarry near Leeds diversified into soil washing and recycling. The soil recycling process requires large volumes of water – up to 200,000 litres a day! The same limestone rock which the quarry once extracted is a highly productive aquifer. Hydrogeo handled the design, installation and pump testing of a large diameter borehole. A license was granted by the Environment Agency, and the quarry’s new plant is now operational. This major soft drink brand uses large quantities of water, both in the finished product and during the manufacturing process for cleaning and cooling. Previous efforts to install a borehole at the site had led to a poorly yielding borehole. 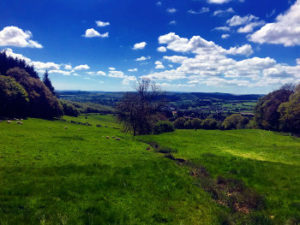 Hydrogeo undertook a a detailed study of the site geology and hydrogeology, including field reconnaissance. The borehole prognosis showed that a large geological fault was crossing the client’s land. Drilling to target this fault at 160 metres below ground level led to a plentiful supply of water and a successful borehole installation. 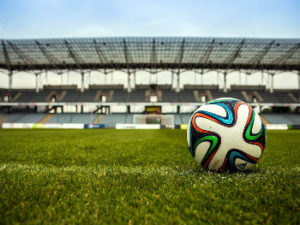 Installation of a borehole at both a football club provided a source of water for pitch irrigation. The installation beneath the club was made difficult by mine workings, which can complicate well drilling and installation. A detailed study of the predicted location and depth of the workings led to a successful well installation. The flooded workings proved to be highly productive, and provided more than enough water to meet the needs of the club. 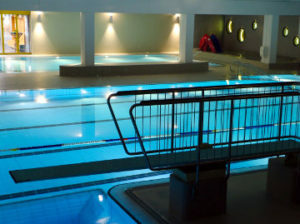 This well known chain of leisure centres uses large volumes of water at each of its sites for landscaping, irrigation and leisure facilities. Fortunately, the geology beneath the centres was favourable for the installation of highly productive boreholes. The provision of clean water in high quantities provided significant savings on mains water supply at several of the sites across the country.